Sell tickets to walk-up customers at your event. We provide everything you need. The RapidScan Box Office app works on iPhone or iPad. It processes cash, card and Apple Pay with iZettle, captures customer data to add to your mailing list and prints tickets and receipts. If you're already using Skiddle to sell tickets, you simply have to add some additional 'on the door' tickets for use at the box office. There's no separate systems to learn or manage, everything's controlled via the Promotion Centre. Our RapidScan box office functionality lets you accept major UK credit card (including American Express), leaving more cash in your customer's pockets to spend at the bar. All you need is the RapidScan app and a bluetooth card reader, which can be purchased from Skiddle at a low cost. There's no merchant accounts to set up or agreements to fill in. You simple plug in and start selling. Funds are settled into your account alongside your regular Skiddle ticket sales, a few days after your event. You can also accept contactless and Apple Pay at your event, at no additional cost. Customers can also pay with cash. The app will track all cash payments and give you a reconciliation report, so you know exactly how much cash each staff member has handled on their shift. There's even an optional automatic cash drawer, to keep your cash secure. You can easily check how many sales you've made, either using the app or remotely using the Promotion Centre. If you want to limit how many tickets can be sold, no problem. 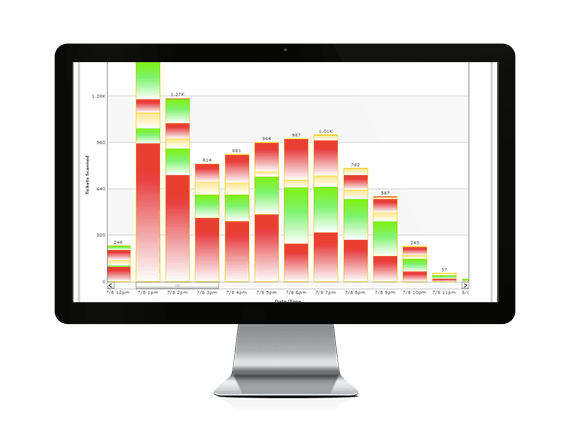 You're probably missing a big opportunity to grow your database, by not capturing customer data for walk-up-sales. With the RapidScan app you can decide how much customer data you'd like to capture for each sale, all of which will be recorded in your promoter account for future marketing. By hooking up a bluetooth printer, you can print receipts and barcoded tickets on the spot. Alternatively, details are sent to the customer's email address and/or phone. The mobile box office app is incredible; it worked fantastically and has the potential to streamline any future operations for box office and bar tokens. We were really glad that we used it; the processing of card payments happened very quickly. We look forward to using the app at our other events and festivals. We found the mobile box office app really easy to set up and use at Village Green. It was extremely stable throughout the event and we were able to monitor figures accurately enabling us to use data collected to prepare for next years festival. Customers were able to use contactless payment on the gate that really helped getting them in quickly and efficiently. How does the RapidScan box office stack up against a regular Chip + Pin terminal? 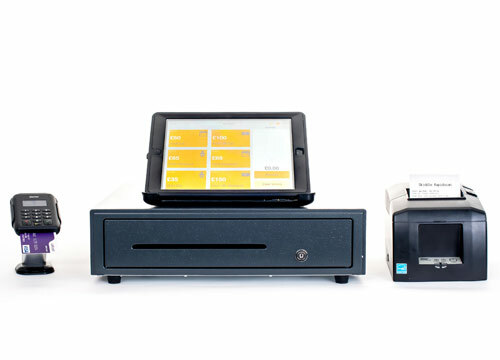 We also offer a complete kit for hire, including an iPad Air, Bluetooth contactless card reader, receipt and ticket printer and cash drawer. All packaged in an event-proof, waterproof flightcase. Rental cost is £200 per event. Full of features to help you promote your event.